The current generation of children is surrounded by entertainment mediums; our culture thrives on film and television. But rarely, are children given the opportunity to explore their own creativity through these mediums. Often, the artistry of kids are overlooked in filmmaking, with no outlets or trainings available to teach them how to turn their imaginations and ideas into movies and shows that can give life to others. Kids TV is a filmmaking program that allows the voice of kids to be heard. Through the Kids TV program, kids acquire the practical and technical training needed to transform their imaginations into reality. We create a fun learning environment for the kids of today to become the filmmakers and producers of tomorrow. 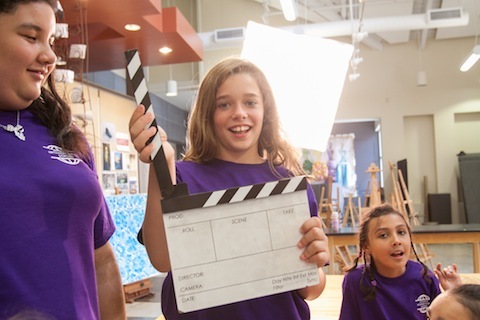 During a 12-15 week period, kids work together to develop, produce, and film a TV Show, Movie, or Music Video. 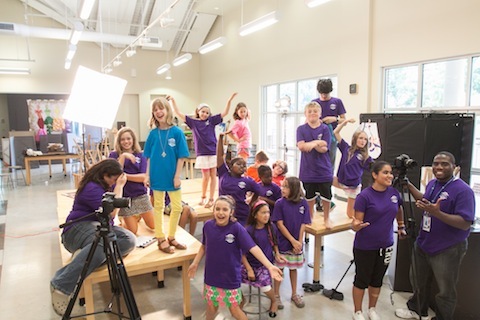 The kids work hands-on to learn camera and lighting basics, an overview of the filmmaking process and crew positions, story development as well as teamwork and organization. Our program semester ends with the kids hosting a premier screening for all of the parents and guests. If you would like to recommend your school to be a program site for Kids TV, please visit our contact page or send an email to our program director. Brandon Jolley is a director/ videographer residing in Atlanta, GA. After receiving his Masters in Film Production from Georgia State University, he began working for Tyler Perry Studios. Being mentored by Producers and Assistant Directors for Tyler Perry, Spike Lee, and Martin Scorsese, Brandon learned production management and producing. He has directed and produced various short films, a documentary/viral videos, and music videos. Prep for first day of production (i.e. shooting the film/show).